AMIPAK A - For use on automatic equipment. 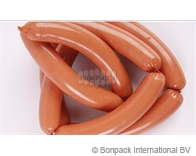 When used on automatic hot-dog machines, no additional preparation is required before stuffing. Supplied in shirred sticks with a closed end. AMIPAK LS A - Easy-peel casing for manual removal off the product. Designed for use on automatic equipment. Supplied in shirred sticks with a closed end. AMIPAK E A - An economy version of the casing with a closed end of the shirred stick, designed for use on automatic equipment. AMIPAK R - Designed for manual tying and use on stuffers with twisting devices. Supplied in shirred sticks with an open end. AMIPAK LS R - Easy-peeling casing for manual removal. Designed for manual tying and use on stuffers with twisting devices. Supplied in shirred sticks with an open end. AMIPAK E R - An economy version of the casing with an open end in the shirred stick; the casing is designed for manual tying and use on stuffers with twisting devices. AMIPAK Ako - For use on automatic equipment. Supplied in shirred sticks with a closed end. AMIPAK Rko - For manual tying and use on stuffers with twisting devices. Supplied in shirred sticks with an open end. Colors: Smoke, light smoke, clear, orange, pink, crimson and others. Bespoke colors are available. Printing: 1-sided and 2-sided; multi-color; full color.